Join a Growing Movement: Learn how you can join more than 1,000 Certified B Corporations from 80 industries and 35 countries—led by well-known icons like Patagonia and Ben & Jerry’s and disruptive upstarts like Warby Parker and Etsy—in a global movement to redefine success in business. Build a Better Business: Drawing on interviews, tips, and best practices from over 100 B Corporations, author and B Corp owner Ryan Honeyman shows that using business as a force for good can help you attract and retain the best talent, distinguish your company in a crowded market, and increase customer trust, loyalty, and evangelism for your brand. More than 1,000 companies from 80 industries and 30 countries are leading a global movement to redefine success in business. They’re called B Corporations—B Corps for short—and these businesses create high-quality jobs, help build stronger communities, and restore the environment, all while generating solid financial returns. 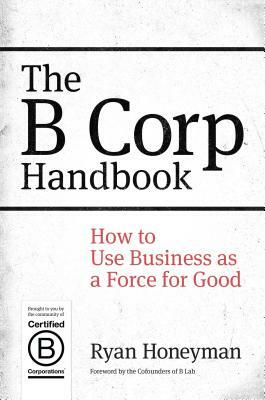 Author and B Corp owner Ryan Honeyman worked closely with over 100 B Corp CEOs and senior executives to share their tips, advice, and best-practice ideas for how to build a better business and how to meet the rigorous standards for—and enjoy the benefits of—B Corp certification. This book makes the business case for improving your social and environmental performance and offers a step-by-step “quick start guide” on how your company can join an innovative and rapidly expanding community of businesses that want to make money and make a difference. Ryan Honeyman is the founder of Honeyman Sustainability Consulting, a Certified B Corporation. He helps businesses save money, improve employee satisfaction, and increase brand value by maximizing the value of their sustainability efforts—including helping them certify as B Corps. Ryan writes about B Corps in media outlets like TriplePundit, speaks about B Corps at places like the UC Berkeley Haas School of Business, and consults with B Corp clients like Ben & Jerry’s, Nutiva, and CleanWell. —Tony Hsieh, New York Times bestselling author of Delivering Happiness and CEO, Zappos.com, Inc.